Originally we planned to visit Busch Gardens Tampa on Saturday but we changed this to visit Howl-O-Scream for their media event. This turned out to be an excellent idea as the sky did look like rain, which kept the crowds nice and low but the humidity was rather annoying. Busch Gardens Tampa is located in Tampa Bay, Florida. This park is about an hour southwest of Orlando and about an hour north of Naples, which gives the park a great location in Central Florida. Far enough from the Orlando theme parks that it can easily stand on it's own as well as offering the best coasters in the state. Originally owned by Anheuser-Busch it opened in 1959 was a beer tasting center and a bird garden. Over the years the park evolved into it's theme of "Africa" which differs from it's sister park in Virginia. In 2011 the park changed hands and is now managed by The Blackstone Group, the jury is still out over if this was an improvement or hindrance. 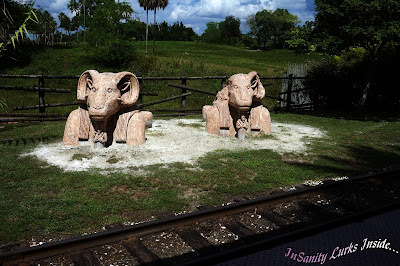 Busch Gardens also has a large African Animal collection which is visible in the park, they are accredited by the AZA (Association of Zoos and Aquariums). We began our day around 11am, it had been a rather long while since any of had visited Busch Gardens Tampa. Our last time being 2006 and Jennifer hadn't gone since 2000, so we expected a lot of changes in the park. We found them right as we exited the entrance plaza. The most noticeable change is the area around Cheetah Hunt. This was once only home to the Crown Colony Restaurant, The Clydesdale Barn and the Skyride/Monorail building. Needless to say a LOT has changed. The newest roller coaster 'Cheetah Hunt' is now in that building as well as some wonderful animal additions which really improved an otherwise dull area. To begin with, they have Cheetahs! 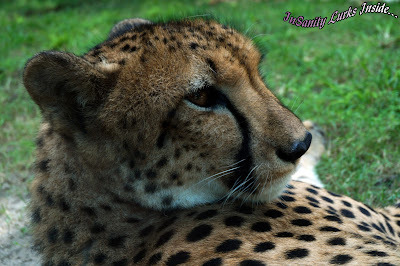 Such beautiful big kitties, if I could have figured out a way to smuggle one home.. I would have. Never doubt that! They've got a wonderful large area across from their namesake attraction where the park also offers 'Cheetah Runs'. 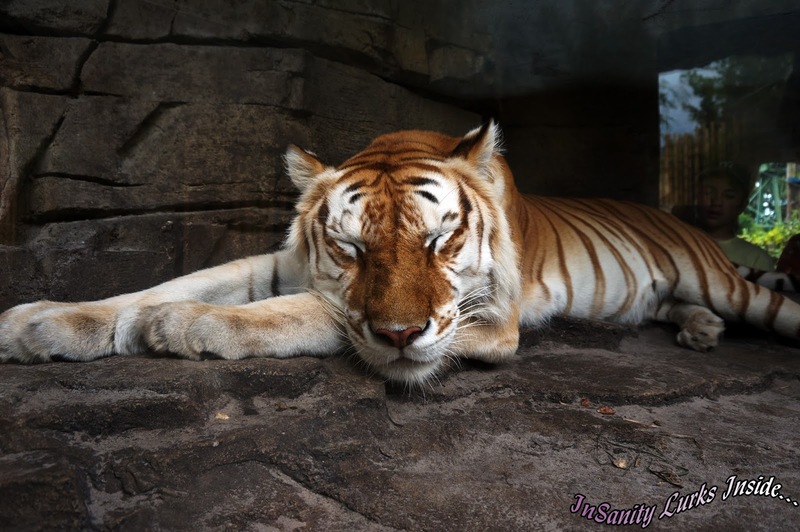 These showcase the big cats speed and agility, while we didn't get to see this we got a wonderful look at the area and found it both pleasing to the eye and big enough that you didn't worry about the animals having enough space (unlike some zoos I've visited in the past). This big kitty was even nice enough (or lazy enough) to pose for us in a "Cheetah Don't Care" style! After some cooing over the big cats, we had planned to ride "Cheetah Hunt" but as we looked up we noticed a train going awfully slow. Rather a good thing we didn't get in line as the ride stopped shortly afterwards. Naturally, we had to stop and do a little gawking which is how we snapped the photo to the left. Unsure of when the ride would be operational again, we decided this was a perfect time to grab some lunch. So after telling the folks stuck on the ride "Good Luck" we headed back towards Crown Colony. Now in the past Crown Colony has always had excellent food. Right now the upstairs "table service" area of the restaurant is closed due to the slow season, so we headed to the second floor and the cafe. Inside we found rather monster potions of food. Kitsune and I split the large club sandwich and the mound of pudding seen in the background. Jennifer had the huge slice of pizza and another monster sized mound of pudding. Overall the food was very good and portion size was excellent, it's plenty for one or even two people to share. 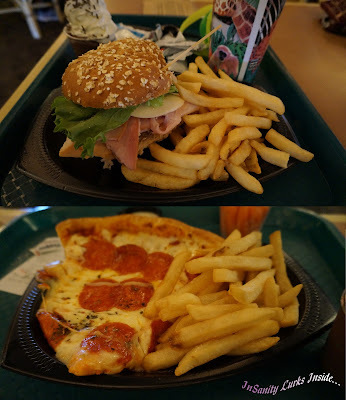 The pizza was swimming in cheese and the sandwich had high quality meats, plus the stack of fries on the side and we were all full. Then came the pudding, I don't know what Seaworld Parks puts in this pudding but it's always excellent.. and the whipped cream on top is decadent! Overall each lunch was around $15 each, a good value all around! After lunch we took a break to let ourselves digest our massive meals. 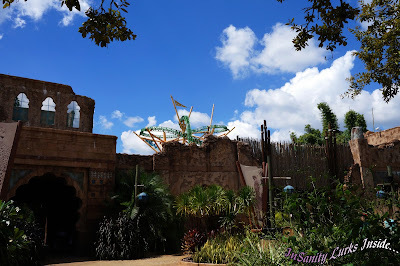 As we passed by we noticed that 'Cheetah Hunt' still wasn't running so we headed deeper into the park and over to the Egypt section of the park. Montu. Oh what can I say about one of my favorite coasters ever? Try this one for size, while Montu is now 17 years old, it runs smoother then glass. I can't wrap my brain around how very smooth but wicked this ride is. 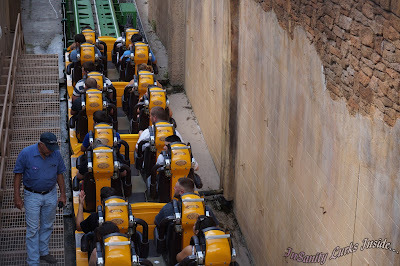 Montu doesn't have a "zero car" in front of it's train and I'm really beginning to believe they aren't a benifit to the rides which have them. All the coasters which have a "zero car" have gotten rough while Montu and other coasters which lack them have stayed smooth as silk. You won't bang your head on this ride. Well, at least not as long as your not being stupid! 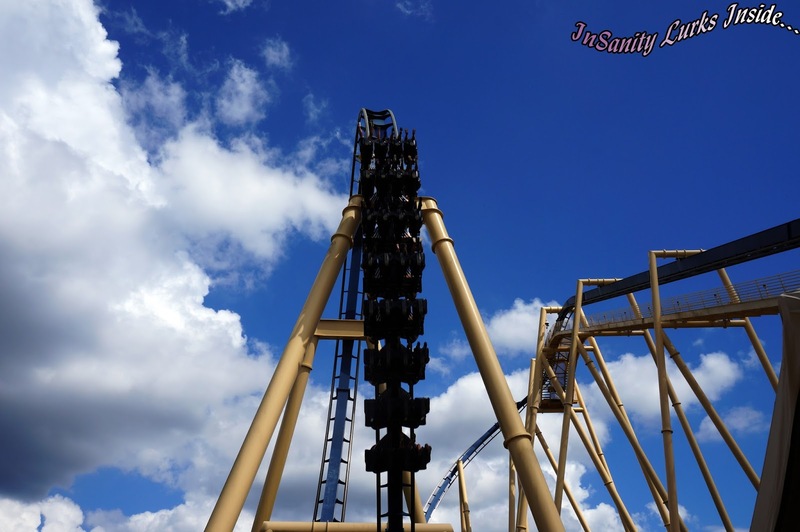 Let me throw another one at you, Montu has an insanely quiet lift. Honestly, I'm not entirely sure what Busch Gardens has altered on this beloved ride but it's for the better! We did notice Montu has gone down in it's Ge-Forces with the addition of a skid break just before cobra roll. While this is nice for low-tolerance riders, those of us who squeal with joy when rides are out to kill us noticed a difference. 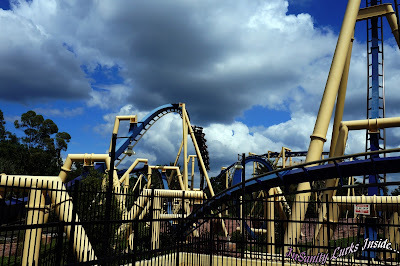 It's a good difference to be sure but it does make Montu a little less intimidating then the past. Either way, it's still a superior ride compared to it's rough sister in Virginia. After this we had planned to hit the train station and get a good view of the animals on the back side of the Serengeti area. However, something had changed since our last visit. We found the Egypt train station closed permanently for boarding. That area was now a smoking section, which we didn't mind, but we found it odd that they closed the station. However, we did get a smile out of the fact they left the Egyptian statuary in place! Next we headed into the Nairobi area of the park. From here we check out the new "Animal Care Center" which was just completed last year. I have to admit, this was a huge improvement over the previous one which guests couldn't really view. We also got to meet this very pretty African bird called a Turaco. She was very friendly and rather vocal, her handler knew plenty about her also. We found out that her red feathers where once prized by African kings. In Nairobi we found a lovely trail area called "Edge of Africa" with great animal habitats. Flamings, Lions, Hippos, Gazelles and More can be found in the shady groves with some great viewing points. 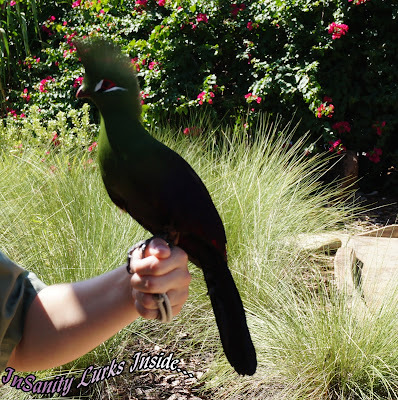 You can see more animal images by visiting our full photo post here: Busch Gardens Tampa- Photo Report. Next up was Timbuktu, which I admit is a bit of a chaotic mess right now. 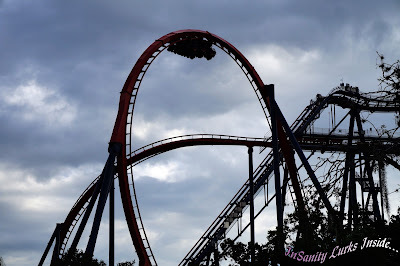 Busch Gardens is building in this area at the moment and in Spring 2014 will be opening their first drop tower attraction called "Falcon's Fury". We didn't get many construction pictures as the attraction hasn't gone vertical yet. While this new attraction will be a good addition to the park, it does make getting around the area a hard. You'll also find the roller coaster "Scorpion" in this area. While we didn't get a chance to ride it this time around, I can say from the past this classic 80's coaster is a blast from the past and fun as hell! Ahh Kumba, I do love you. This was one of my first "adult sized" roller coasters. A classic B&M coaster from 1993, Kumba still has it's roar. 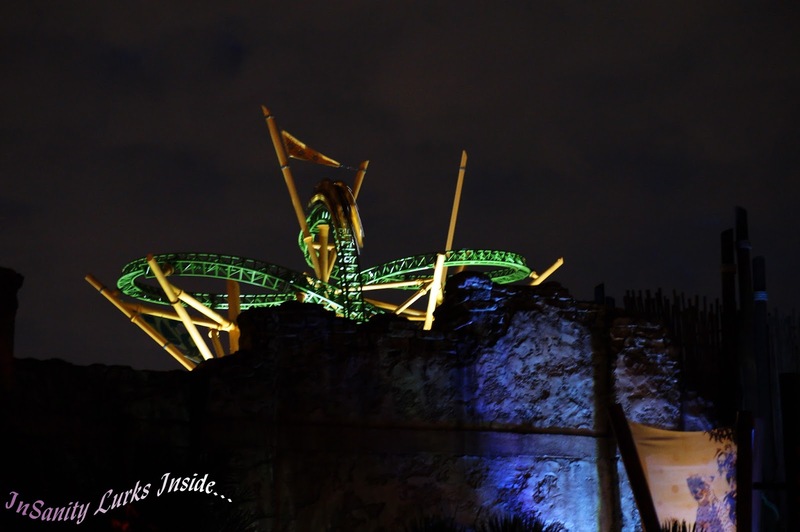 I'm not sure what kind of magic Busch Gardens Tampa works while the park is closed at night but Kumba, much like Montu, runs smooth as glass. This ride won't bang you around and shake you stupid, it's almost like you float through the track. Unlike other coaster brands, B&M's tend to stay smooth but rarely are they this well kept into their late age. The double corkscrews still thrill and the ride has only improved with age. It's an angry Floridian and you know it but that makes it so much more fun! Although I admit I'm not a huge fan of the new bridge nets which you can see in the picture but I can understand why they have to be there now. Onto Jungala and one of my favorite parts of Busch Gardens Tampa, their Tigers! I swear, this must be the most spoiled and pampered big cats anyplace. Also some of the most beautiful. Busch Gardens Tampa has had a white tiger as their mascot animal for as long as I can personally remember but this pretty kitty was just too beautiful to not share with the world! The rest of Jungala didn't hold must interest to us as it's a large playground type area featuring climbing nets and tunnels. I don't think any of our knees would appreciated it if we tried to enjoy it! From here we headed into Stanleyville and to their second newest coaster, SheiKra. This coaster was there last time we visited but at the time it boasted huge lines, so it was skipped over. Much like it's sister coaster in Virginia, SheiKra is a vertical drop floorless coaster. These rides are always smooth and filled with air-time, this one is no exception. Although I admit we where rather surprised by the crazy, duel loading station. While a little shorter then Griffin at Williamsburg, this ride delivers everything a great coaster should! By this point the park was getting ready to close for Howl-O-Scream, since we planned to attend this event also we headed out. As soon as we returned, we headed straight for 'Cheetah Hunt'. We were determined to ride this before the night was over! At first, I admit, I wasn't entirely sure about this coaster being great. From the ground it appears very slow the 'Figure 8" area at the beginning of the ride. Wow. I'm pleased to report I was utterly wrong in the best possible way! 'Cheetah Hunt' is an amazing and excellent addition to an of the park which in the past was rather devoid of activity. The launches are smooth, the ride is both exciting and thrilling. 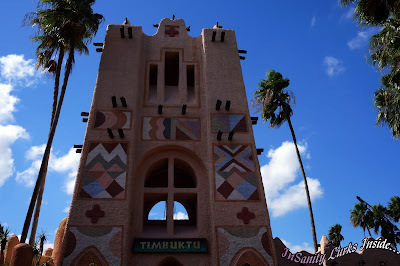 It's also much longer then it appears from the opening area with the ride ranging all the way back into the Nairobi area. It twists and turns, tossing about. Really it does feel like what a cheetah would do and this really gives the ride a world class rating! If you haven't ridden, you need too! I'll admit, I've always really enjoyed the Seaworld Company Parks. However this tends to make me even more critical of their actions and attractions. While we didn't hit up the flat rides, I can speak from experience they are also very good. We've all ridden them many times before, although some are closed right now due to the construction of Falcon's Fury. I'd suggest checking with the park to see what is currently closed. I'm happy to report that Busch Gardens Tampa is worth every penny you'll pay in admission. 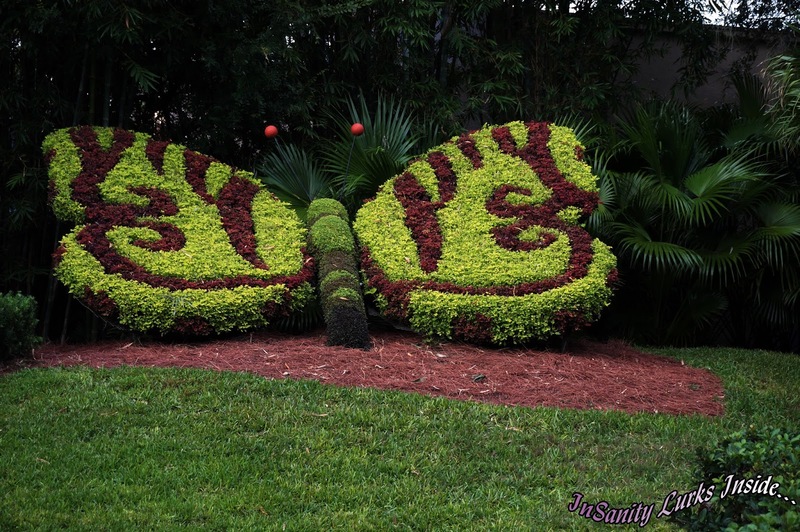 It's an excellent theme park and zoo, if you haven't visited this park you really need to go. Not only is this park great for older kids and adults, they've got a world class kids area themed as Sesame Street. 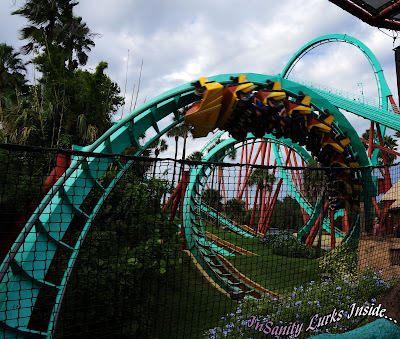 Busch Gardens Tampa will deliver you thrills and chills for all ages, no visit to Central Florida will be complete if you don't take the time to visit this wonderful theme park! Please Visit our Review of Howl-O-Scream 13! 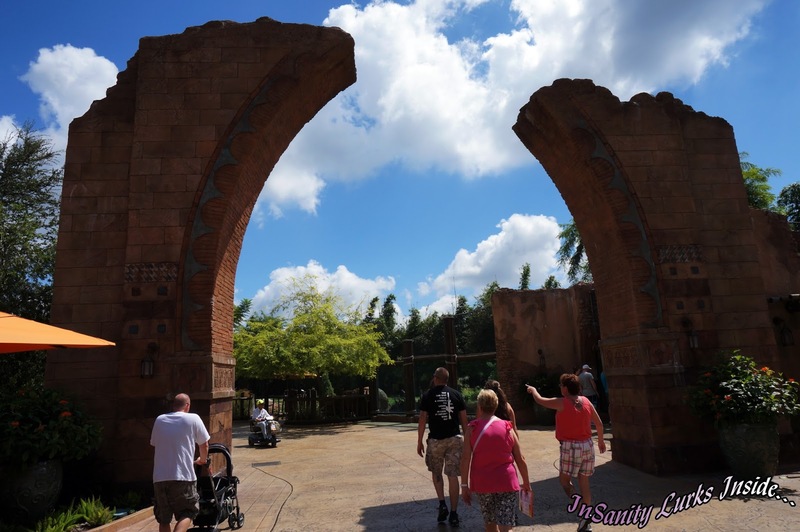 Please Visit our Photo Review of Busch Gardens Tampa!